By now you have probably noticed a bit of a trend with me. When I discover a new dish that rocks my world…it becomes my complete obsession to recreate it and put my own spin on it. Maybe I should have more accurately described my mood in this post as ‘obsessed’. I can only describe the feeling as something I need to do, it consumes me, I can’t stop thinking about it, I start writing down the flavours and then suddenly I am shopping for ingredients and I cannot stop until i’ve done it. This is basically what happened to me the first time I tried ‘Thai Beef Salad’. 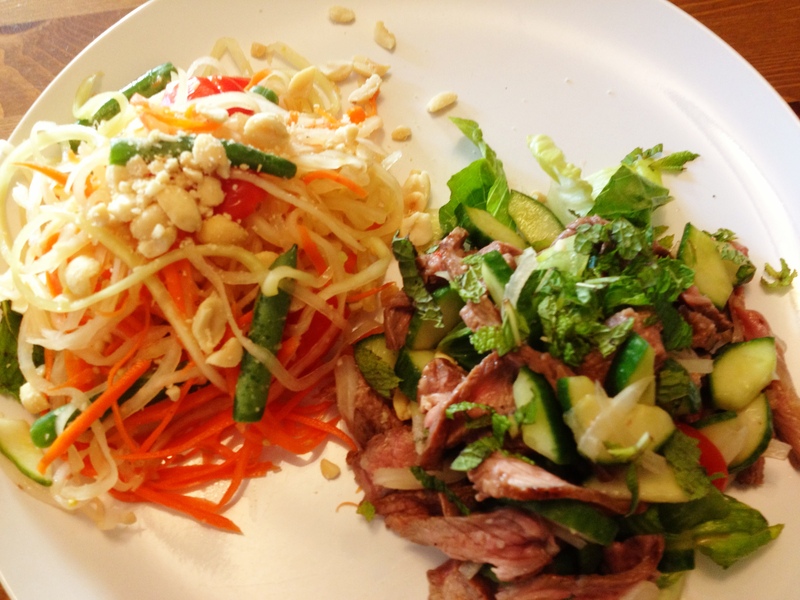 If you’ve never tried it before, I can pretty much bet you are thinking…’meh, beef in a salad…not really my thing’ or if you are going out for thai food, the last friggen thing you want to order is a flippin salad, you want drunken noodles or pad thai…am I right? Trust me on this one…if you have never tried it, please please do!!! It will turn your world upside down. It’s flavours are salty, sour, sweet and spicy all at the same time. It’s insane and it’s like a fireworks explosion for your taste buds. One thing to be aware of is that whenever I have tried this dish, it tends to be wicked spicy. Sometimes I don’t mind that but not everyone likes heat so i’ve tried to tone down the heat but using minimal chilli in this dish. I wanted to get a bit of heat and avoid that feeling of disappointment when you make something way too spicy that you can’t even enjoy it. Believe me, some of the recipes out there call for like 10 chillis. Wowsa. I know you aren’t supposed to talk about this kinda stuff in a food blog but all I gotta say is the burning ring of fire. No thanks!! I took plenty of pics while I did this so you can see exactly the process and just how easy it is. I am one of those people that likes to prep everything in advance (as much as I can) so that when it’s dinner time, I can just throw it together and it’s ready in no time. I also don’t like it when i’m cooking for people and i’m running around like a bat out of hell, sweating and not being able to hang with the people i’ve invited over. 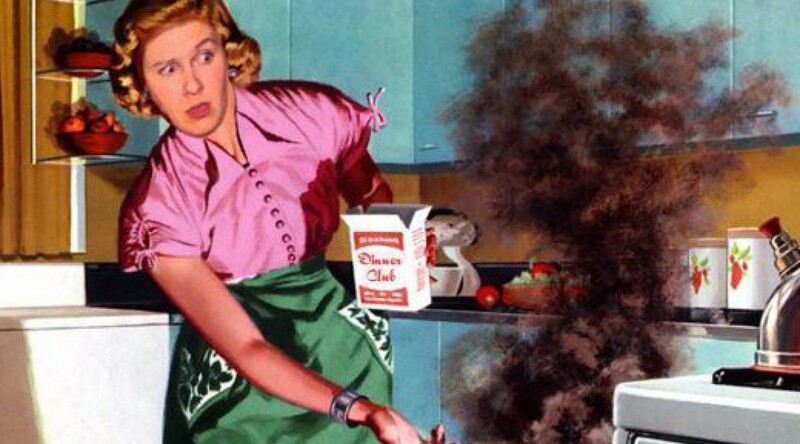 I want them to rock up to my place, hang out, serve them something delicious and them think…’how the hell does she do it?’…Nigella Lawson ain’t the only domestic goddess out there you know! 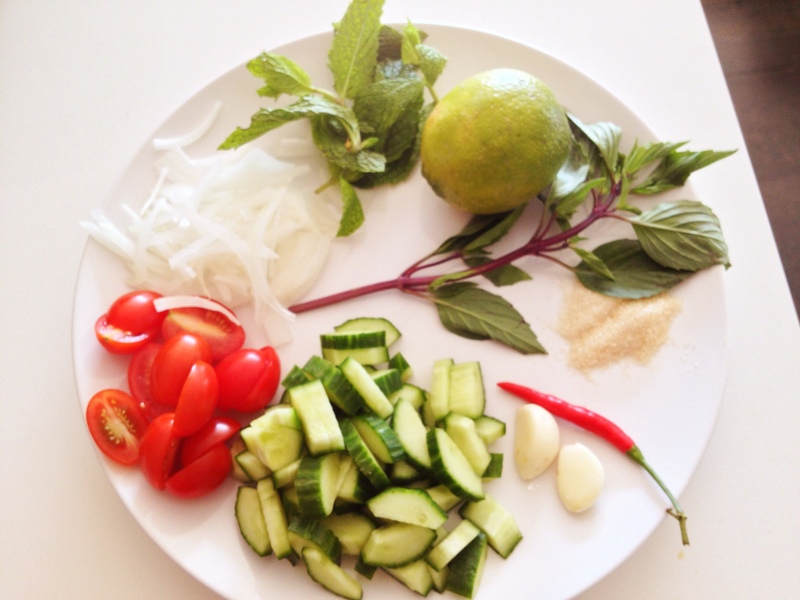 Look at these beautiful and fresh ingredients. 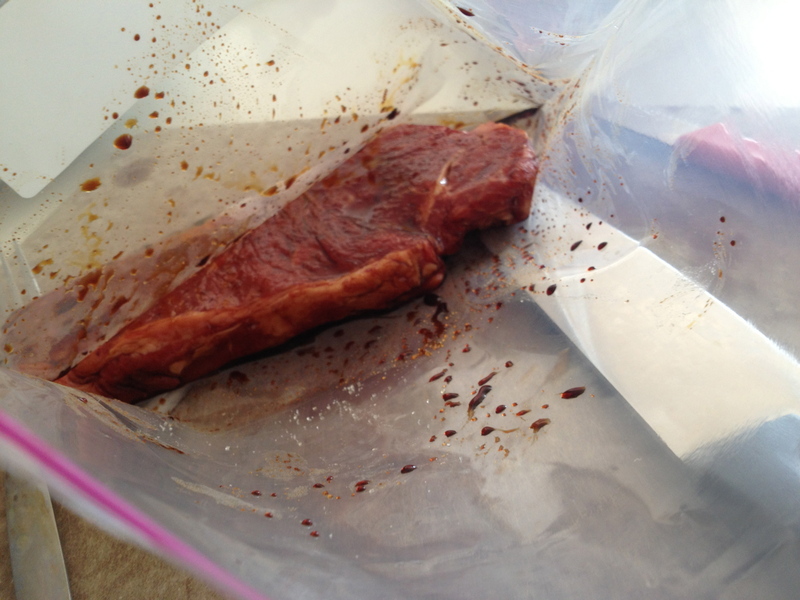 Next, marinade your meat for a bit. Here’s the deal, this is absolutely not required. 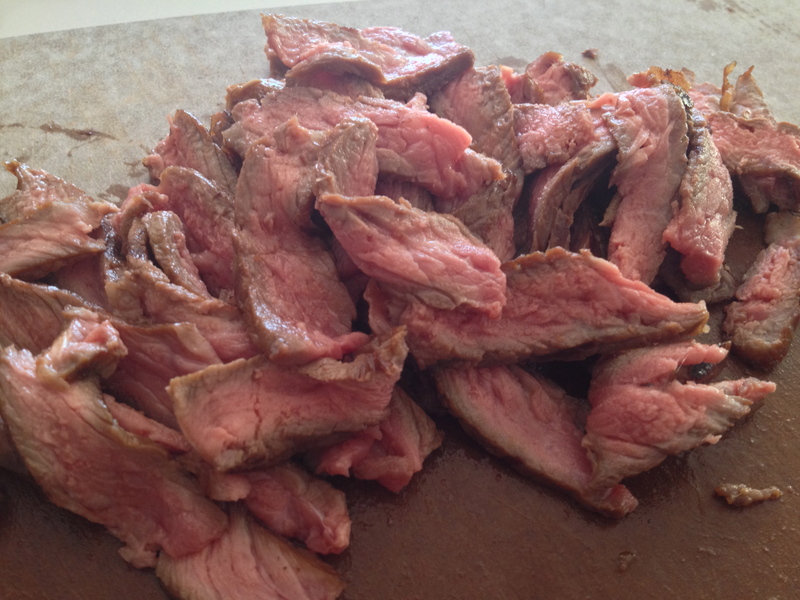 Grilling a decent quality steak requires no marination. I did in this case for a few reasons: 1) I don’t always buy super expensive cuts of meat and marinading them seems to make a lower budget meat taste pretty damn good 2) I love a bit of caramelization after its been grilled, I think it really adds to this dish. I made seriously just used 2 ingredients: 1 tbsp of soy sauce and 1 tbsp of sugar. Next you are going to make the dressing. Again, I like to make this up ahead of time just so I can whip this salad together in no time. Okay people we are going to use some fish sauce in this dish so man up and get ready for the stank. Don’t be alarmed at the smell of fish sauce…yes, it’s rank, it smells awful and you are going to question why the hell you are about to cook with it but trust me…this dish requires it. 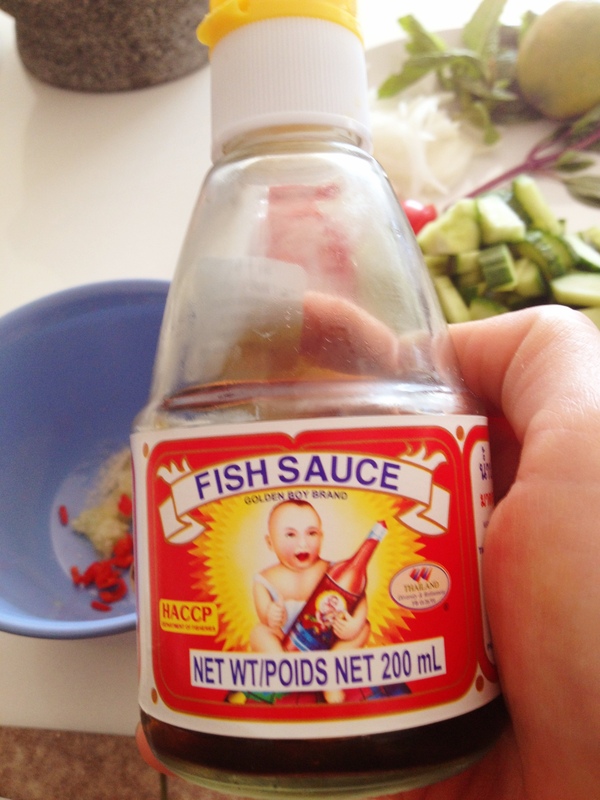 I want you to be safe friends and handle with care because if you were to ever drop or spill a bottle of fish sauce you would hate yourself, your friends would stop visiting because it really does smell awful. I like to use Golden Boy brand. 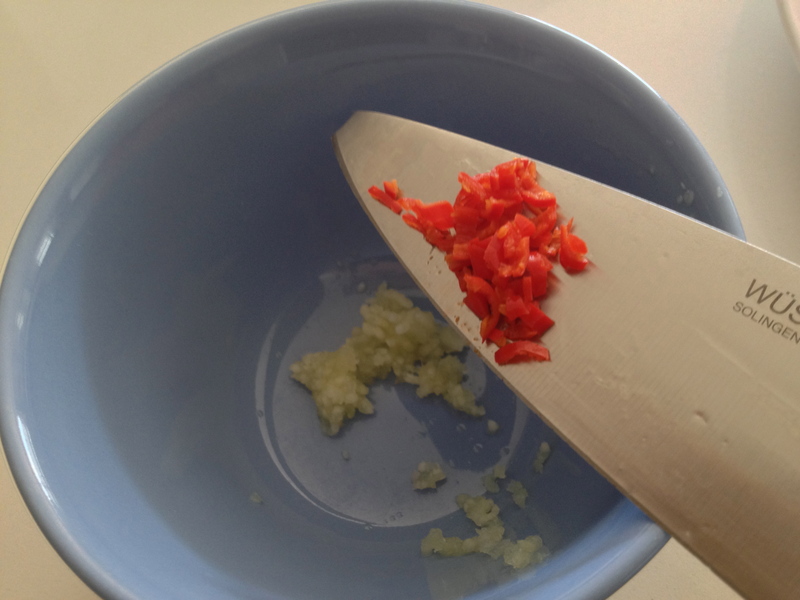 Mix finely chopped chilli, minced garlic, fish sauce, lime and sugar in a small bowl. Stir until the sugar is dissolved. This is what the dressing should look like. Grill your steak for a few minutes until it’s medium rare. Trim off any excess fat and let it cool a bit. Once it’s cooled off a bit, slice it really thin in to pieces about 2 inches long. Next, make a bed of lettuce and put on a platter or plate. Place the beef mixture on top and then sprinkle some of the fresh herbs on top. I am very rarely allowed to put cilantro in dishes because husband despises it and is one of those people who think it tastes like soap. If he was not around, I would be putting some in this dish. He also doesn’t really care for the other herbs but there is no way in hell that I am going to have a beef salad without mint. You can also sprinkle some crushed peanuts on top. I paired it with my home made green papaya salad (recipe coming soon to the blog and lots of fun pictures of the process) and it was pretty much a dinner win!! It’s not very often dinner that only consists of salads can add so much pleasure and joy to the dinner table. 1 Medium lime. Please for the love of pete, use a real lime not that squeeze bottle stuff. Don’t worry, I buy that crap from time to time but in this recipe, I beg you to use the real stuff!! Grill the steak until it’s medium rare. Let it cool for a few minutes and trim any excess fat off of it. Slice in to very thin pieces about 1 1/2-2 inches long. Make the dressing. *You can totally do this in advance too, depends on your mood. 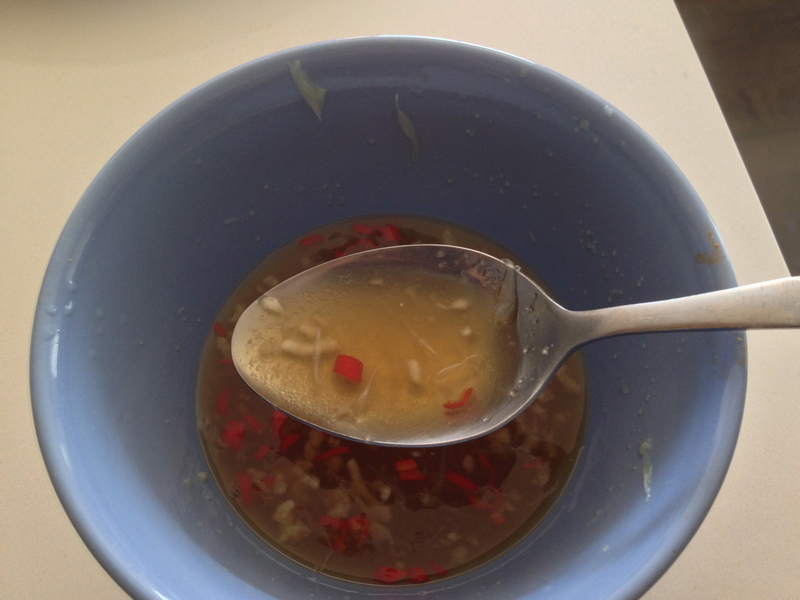 To make the dressing, you will mix garlic, chilli, fish sauce, sugar and the juice from the lime in a small bowl. Stir until the sugar is dissolved or it will be grainy and people might think you put sand in their salad. 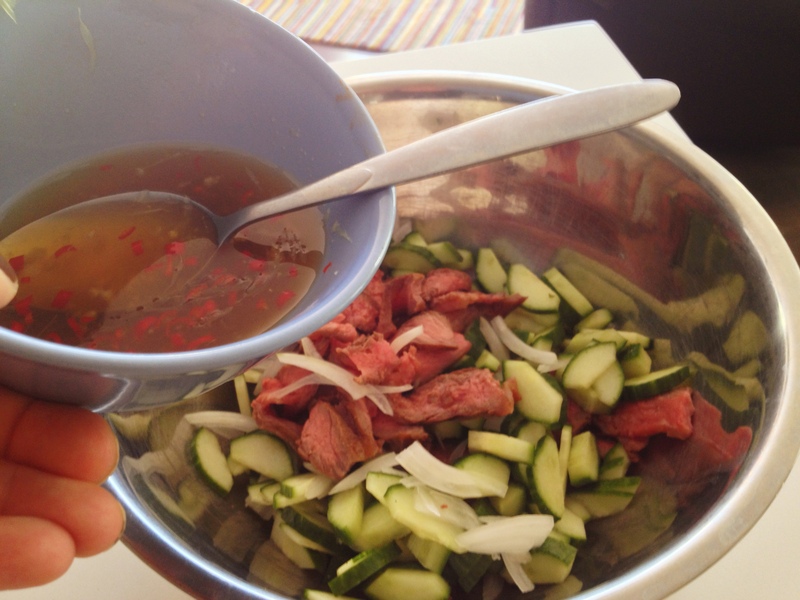 Mix the steak, tomatoes, cucumber, shallots/onions together and pour the dressing over it. 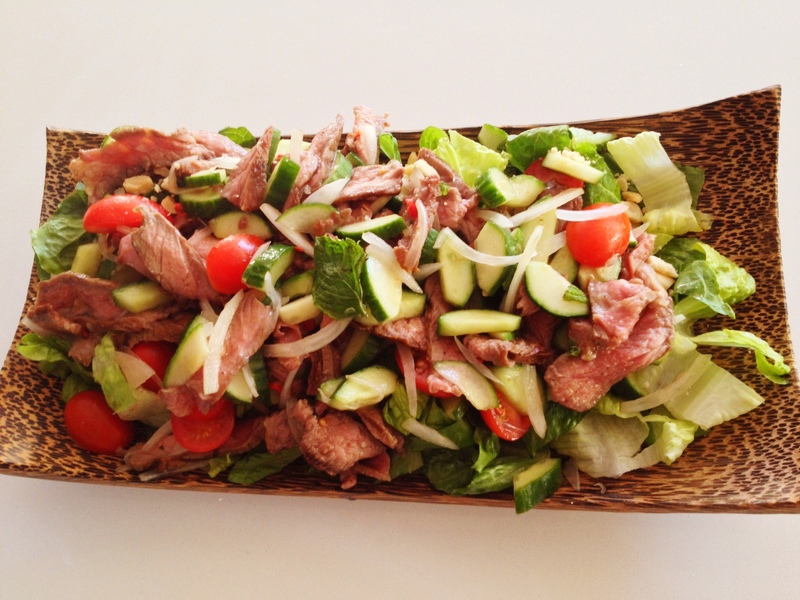 Take the steak mixture and place it on the bed of lettuce. I hope you you are feeling adventurous and try this dish!! Get ready for a party and tell your taste buds…they are welcome! And yes…I also like meat, especially when cooked with zingy flavours and lots of vegetables like this!